No search? No problem. Just send the post to your saved section of Facebook and come back to it later. One of the most annoying things about Facebook is that it lacks a solid search tool. It’s just impossible to find that great post, article, or video you came across a few days earlier. With a little presence of mind, however, you can save yourself from having to scroll through a friend’s posts to find that essential link. Facebook introduced a “save” feature nearly two years ago, which lets you stash anything you see on Facebook to a private area of your account. The save option on Facebook.com. 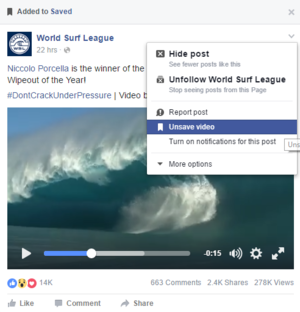 You can use this feature to create a read-it-later list, a collection of funny videos, a scrapbook of interesting posts, or a big jumble of everything. 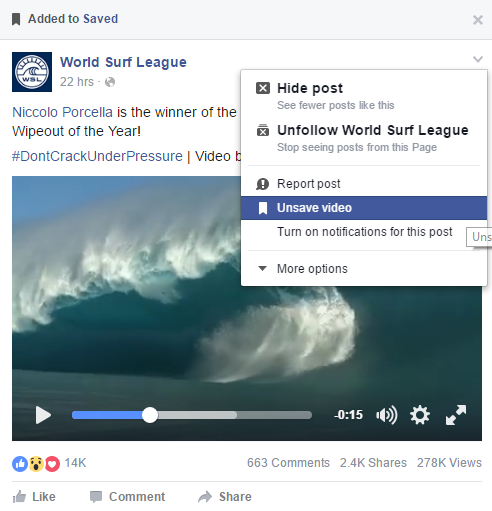 This feature may get even better in the coming months as Facebook recently announced a new Save to Facebook button for websites. This will let you grab items from third-party sites for your saved section on Facebook without having to leave the page you’re on. Today, we’ll just stick with how to use Facebook’s save feature when you come across interesting items on your own news feed. This feature exists on the mobile apps, but we’ll be covering how to use it from your PC. When you come across content in your feed that you want to save, click the downward-facing arrow in the upper right-hand corner of the post box. After the hide post and unfollow options you’ll see an option to save the content. It will say something like “save video,” “ save post,” or “save link.” You may also see options to “save product” if what you’re saving contains a link to a commercial website like Amazon. The Saved link in the navigation panel. Once you see the save option, click on it, and a small confirmation banner will appear above the post that says Added to Saved. Now, whenever you want to see your saved items you can either navigate to Facebook.com/saved, or click on the Saved link in the left hand navigation panel. The saved icon only shows up after you’ve started saving items. That’s all there is to it. Any items you save to Facebook on your PC will also show up on the mobile apps—including the mobile web app.